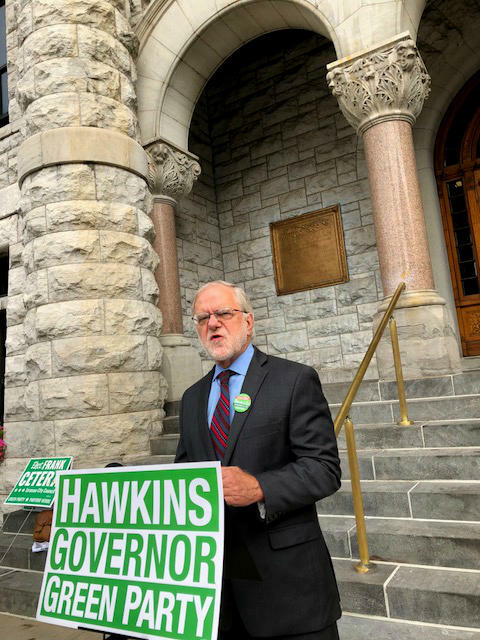 Howie Hawkins 'relaunched' his Green Party gubernatorial campaign in front of Syracuse City Hall, seeking more attention now that primary elections are completed. Gubernatorial Candidate Howie Hawkins says his Green Party has an opportunity to capitalize with progressive voters, many of whom did not want to back Democrat Andrew Cuomo in the recent primary. Hawkins believes he is the best candidate for Governor in the upcoming November election at a time when the nation is going through a political shift, especially for democrats who supported Cynthia Nixon and her policies. Interview runs from 17:20 to 37:40. Green Party gubernatorial nominee Howie Hawkins stopped by for a conversation on the state of unions in New York, NYCHA, and more. Howie Hawkins joins Buff to talk about the Green Party platform, his candidacy for Governor, the myth of the 3rd party spoiler and why Democrats don't vote for a party often more aligned with their beliefs than the mainstream party. Howie Hawkins reads his column in the August 2018 issue of The Indypendent, August 2018. 10 minute audio. Green Party candidate Howie Hawkins visited us in the studio this morning to discuss his run for New York State Governor. Howie Hawkins addresses Nixon's embrace of Bloomberg, the dynamics of the gubernatorial election in the fall, the evolution of the Green Party, and the impact of the corruption trials on the fall gubernatorial election. The Green Party is looking to grow its support in this year’s gubernatorial election. We met the party’s gubernatorial ticket, Howie Hawkins and Jia Lee when they stopped by.